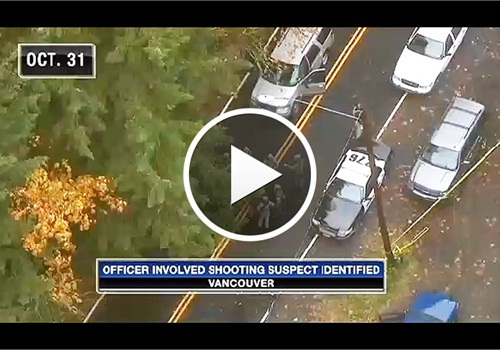 Police officers who responded to a tip about a wanted gunman on the run did not open fire on the wanted gunman - but on the person who dialed 911 to report him in the area, according to new information released by the Vancouver Police Department on Tuesday. A manhunt spread across Vancouver Halloween Friday morning after a murder. During the manhunt, a citizen called police at 9:35 a.m., reporting a suspicious car parked on the edge of a wooded area next to a gravel turnout. That car turned out to belong to suspect John Kendall. Police officers rushed to the area, and when they arrived, they encountered not Kendall, but the citizen who dialed 911. That citizen is white and in his mid 50s, similar to Kendall, police said. Officers watched as the citizen exited his car and circled behind his trunk. Fearing that he was arming himself, officers opened fire, firing multiple shots at the man to stop him from entering the woods. No one was seriously injured in the exchange of shots between the police and the 911 caller, who was also armed and returned one shot in the confusion, Fox 12 Oregon reports. Kendall was later found dead of a self-inflicted gunshot.